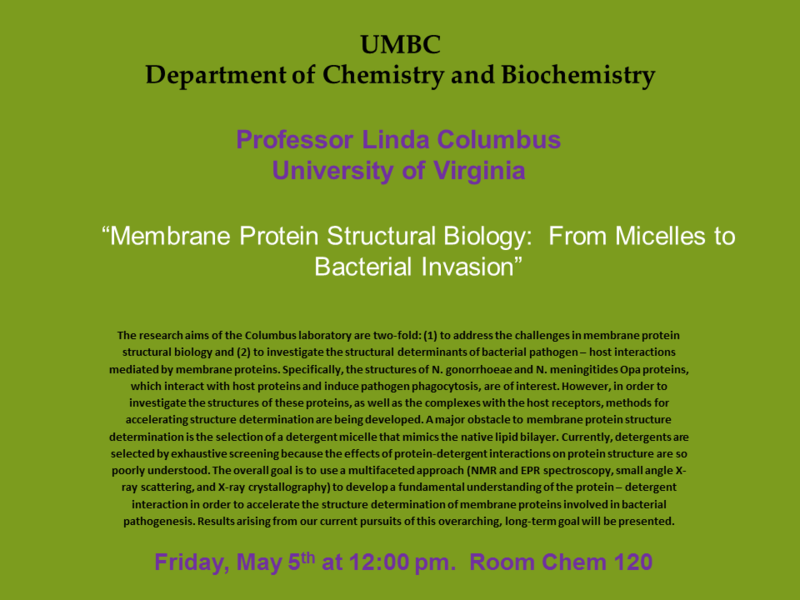 The research aims of the Columbus laboratory are two-fold: (1) to address the challenges in membrane protein structural biology and (2) to investigate the structural determinants of bacterial pathogen – host interactions mediated by membrane proteins. Specifically, the structures of N. gonorrhoeae and N. meningitides Opa proteins, which interact with host proteins and induce pathogen phagocytosis, are of interest. However, in order to investigate the structures of these proteins, as well as the complexes with the host receptors, methods for accelerating structure determination are being developed. 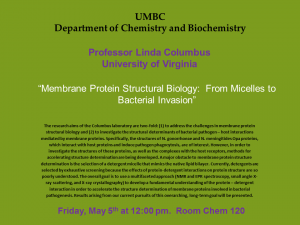 A major obstacle to membrane protein structure determination is the selection of a detergent micelle that mimics the native lipid bilayer. Currently, detergents are selected by exhaustive screening because the effects of protein-detergent interactions on protein structure are so poorly understood. The overall goal is to use a multifaceted approach (NMR and EPR spectroscopy, small angle X-ray scattering, and X-ray crystallography) to develop a fundamental understanding of the protein – detergent interaction in order to accelerate the structure determination of membrane proteins involved in bacterial pathogenesis. Results arising from our current pursuits of this overarching, long-term goal will be presented.